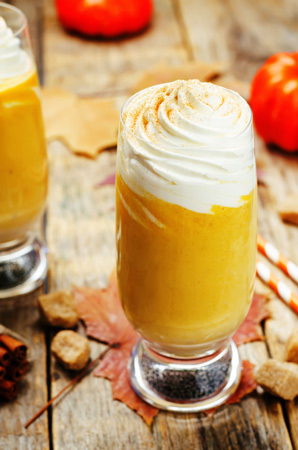 If you love pumpkin pie but just want to skip the whole pastry thing, then why not try a pumpkin pie smoothie. 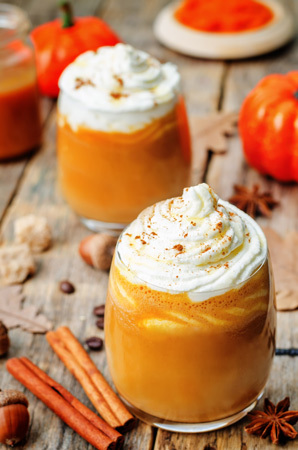 You can still enjoy the wonderful earthy, spicy flavors of pumpkin pie with way less calories and less hassle. There’s no rolling out pastry (if you make your own), no need to turn on your oven, just pull out your blender. The whole thing is ready in just a few minutes. And they’re so much healthier. This is pumpkin pie without the added fat and sugar, but is so substantial it will leave you feeling full and satisfied. You’ll think you’ve just scoffed down a wonderful dessert instead of a healthy smoothie. 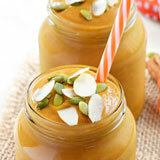 How do you make these smoothies taste like pumpkin pie? Well basically whatever flavors go into a pie, can be replicated in a smoothie. There are many different recipes out there, but I think these ones capture the essence and flavors of that fall classic. Into your blender add the canned pumpkin, almond milk, yogurt, almond butter, Medjool dates, ground cinnamon, nutmeg and whizz together until you have a creamy, smooth concoction. 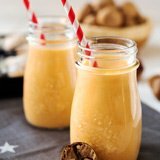 Add the pumpkin puree, frozen banana, almond milk, almond butter, maple syrup, pumpkin pie spice and vanilla extract to a blender. Blend until smooth. Pour into a glass and top with your favorite topping. This will serve two. 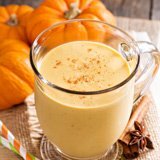 Blend together the pumpkin, coconut yogurt, coconut milk, nut butter (I used cashew butter), and pumpkin pie spice until thick and creamy. This will make 2 serves. If you want to turn these into a scrumptious dessert, just top with some whipped cream, then sprinkle over chopped pecans or walnuts, cinnamon or pumpkin seeds – whatever takes your fancy really.